From the Corona archives. 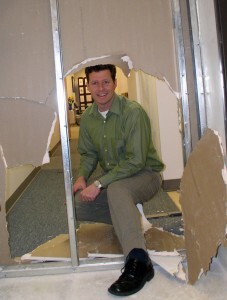 Leo punches through to expand the office space, 2006. While Corona is taking the day off to celebrate the nation’s birthday, we also recently took time to celebrate the firm’s birthday. The beginning of July marked the 13th anniversary of Kevin illuminating the sun here at Corona (seems like just yesterday we were celebrating the firm’s and Kevin’s 10th anniversary). We took time to celebrate with a firm-wide breakfast and reflected on progress made (moving, 1,001th project, to name a few) and results achieved (launching Co-Strategy, a new model for strategic marketing, and many successful projects). We are already looking forward to the next year of adventure. And while we may officially be in our teenage years we promise not to have any of that teenage angst.